Today I want to take a look at the Alara phone case by Brinkcase. This is a really high-quality case intended to reduce EMF radiation exposure for the user, while still protecting the phone in a stylish way. In my review, I want to talk about how the Alara case works to reduce radiation, the science behind the concept, as well as discussing the features of the case itself. I’ll also break down how the Alara case is related to the Pong case, and dispel any myths or assumptions the best I can. Alara EMF Protection Case Review – Is Alara The Same As Pong? First let’s talk about this for a minute, because I feel like there is a ton of confusion about this. If you care about the dangers of EMF radiation, and how we can protect ourselves, you probably have heard of the Pong Case (In fact, at least at the time of writing this article, you can still get them on Amazon). However, on November 17th 2017, the Pong Case, became the Alara Case, announced in the following tweet (among other social channels). I’m still not quite sure what happened, whether Pong was acquired, or just went through a rebranding. However, what I do know is that the Pong Case, became the Alara Case, which fell under the umbrella of the company BrinkCase (I know, a bit confusing). It appears that the look and design of the Pong/Alara case stayed the same and that only the name and branding changed. If you look at the BrinkCase website today, you still see remnants of Pong all over the place, from media reviews to celebrities who have been photographed with the case. Ok, so, Pong became Alara by BrinkCase. Now that we have that cleared up, let’s get to the case itself, first I want to talk about the quality of the case by itself, and then we’ll get to the EMF protection aspect of the design. I currently have a Pong case on my iPhone 7 (No, I wasn’t gifted the case), that I have been using for a few weeks straight to get an idea of how much I like the product itself. I have to say, just the case by itself is actually really nice. I got this one from Amazon and I am extremely happy with the look and feel of the case. One thing I really appreciate is the design. 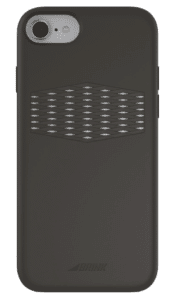 It doesn’t scream, “I’M AN EMF PROTECTION CASE” like so many other products do, it actually just looks like a simple, sleek, stylish case. I love the mesh window that gives you a peek at the copper antenna inside (we’ll get to that in a bit). I also like that the logo (in this case Pong, but newer versions say Alara) is really subtle and just etched into the very bottom of the case. I like that the buttons on the side are not fully enclosed by the case, but instead, the case just dips down to reveal them (in my opinion this gives it a much nicer feel). I also really like the grippy tactile feel of the outer coating of the case. It feels great on the hand and makes the case really simple to use with only one hand. The case is also very protective of the phone itself. It feels very sturdy and well made. On the BrinCase website, they say: “Drop test protection exceeds military specifications.” I’m not quite sure what military specifications they are referring to, but I do believe that it does a good job of protecting the phone. The sides of the case extend just a bit higher than the screen to protect the screen from scratches and cracks when it gets dropped. You can purchase the Alara Case directly on Amazon. Just taking the case as a phone case (and not one that protects from radiation) I actually really enjoy the look and feel. But now let’s get to the most important part of the Alara Case. The Alara is different than the majority of anti-radiation cell phone cases on the market. Most cases, including my favorite from SafeSleeve, work by blocking the radiation from reaching you by means of a flap of EMF blocking material that you flip over the screen of the phone while you’re making a call. This concept is simple to understand, as you’re essentially just placing a material capable of blocking and deflecting radiation between your phone, and your head. The Alara works a bit different. The way the Alara reduces your exposure is actually really interesting, and I’ll do my best to explain it. So as you probably know, your cell phone uses radio-frequency to relay packets of information to cell towers, which emits a form of EMF radiation. Now you can’t completely block this signal, or your phone wouldn’t be able to get information out. This radio-frequency EMF radiation emits in all directions from your phone while you are using it, exposing the brain to harm. Now, according to Brinkcase, if you add any sort of conductive element such as a copper plate to this omni-direction electromagnetic field, you can alter where the majority of this radiation goes. So embedded into the back of the case (and viewable through the mesh window on the back) is a “micro-thin conductive copper element” that has been specifically engineered to act as an antenna for your phone. This antenna picks up most of the radiation, reducing your exposure by as much as 67%, which they say is “As Low As Reasonably Achievable” (hence the name. A.L.A.R.A). So, in summary, there is a specially designed copper antenna on the back of the phone case, that redirects the majority of the radiation away from your head, reducing your exposure. How Is The Alara Case Tested? From what I could find, the Alara case is tested only by the company itself in their own lab (please correct me in the comments if they’ve published independent testing) using SAR testing methods. I’ve written several articles about SAR, or Specific Absorption Rate. Essentially though, it is a measurement of how much radio frequency radiation is absorbed by the human body from a phone. All phone manufacturers must have their devices tested using this same technology and meet regulatory exposure minimums. There is some disagreements among researchers as to whether SAR is a very good indicator of how dangerous a phone is, but we won’t get into that discussion here. The Alara case is tested using this same technology. Basically what happens, is a phone is placed against the head of a dummy, whose properties closely resemble that of a human head. Probes inside the dummy are able to record how much radiation is being absorbed. So images and readings are taken while the phone is being called, and against the head of the dummy. Then those same readings are taken again with the Alara case installed to show the difference. I tested the case myself, using my Trifield TF2 EMF meter. I made a phone call with the case off and recorded spikes in RF radiation. I then made a phone call with the Alara case on and again recorded the RF radiation. It seemed that there actually was some reduction, but not quite a 67% reduction from what I could tell. I did the same test with my Wife’s phone and had similar results. Now it might be that for whatever reason the way this case is designed, the reduction can’t be fully measured using an EMF meter. Again, I just want to reiterate that this doesn’t mean the case doesn’t protect against radiation the way they claim, just that I wasn’t able to see the full difference in radio frequency readings using my EMF meter. Overall I’m pretty impressed with the quality and design of the case itself, and I’ve enjoyed using it for a few weeks. Although I do believe in the product, and that it likely does reduce your radiation exposure, I’ll be sticking to my SafeSleeve case for the time being. I have an easier time understanding how the SafeSleeve case reduces radiation, and I appreciate that it’s tested in an independent lab. I really hope you found my review helpful, if you did, please consider sharing! If you didn’t, let me know in the comments so we can chat about it!